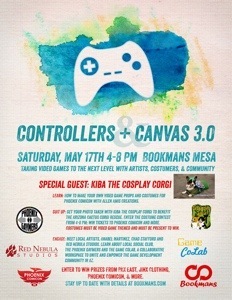 On May 17th, Bookmans Mesa will be hosting Controllers & Canvas 3.0 from 4p-8p. This event brings together the gaming community and local creators and cosplayers. Learn how to make video game props just in time for Phoenix Comic Con or enter the costume contest to win badges to Phoenix Comic Con. More details can be had here!